2016's University Rover Challenge pit 28 student-built rovers against each other in the Mars-like desert. Starting today (June 1), innovative Mars rover ideas will be put to the test in the harsh desert of southern Utah. The annual University Rover Challenge (URC) will see 36 student teams compete near the Mars Society's Mars Desert Research Station (MDRS), a habitat commonly used to simulate Mars missions. MDRS has undergone several upgrades in the past year to both its living quarters and research facilities. While the rover designs themselves are not expected to fly to Mars, the students do deal with real-world engineering problems such as time constraints and budget limits, which help prepare them for jobs in the space industry, URC officials said. "Three of our four tasks have rigidly defined performance metrics," said Kevin Sloan, URC's director. "As rovers successfully complete measurable objectives within a task, they earn a set number of points," he told Space.com in an e-mail. "For example, in the Autonomous Traversal Task, rovers are required to stop at a visual marker and send an alert autonomously acknowledging that the system believes it has completed the obstacle," he said. "In the Extreme Retrieval and Delivery Task, teams are required to drop a specific tool within 1 meter [3.3 feet] of a dummy astronaut." "Our Science Cache Task involves conducting meaningful scientific analysis and delivering a field briefing to judges," he added. "The scores here are much more subjective and [are] based upon the extent of the team's scientific knowledge, the thoughtfulness of their experiments and their understanding of the results." MDRS has run "field seasons" of simulated Mars exploration since 2001, with crews of approximately six people staying in the habitat for two to three weeks at a time. A typical field season lasts from about December to May. During the off-season, upgrades and repairs are performed on the two-floor, cylindrical facility, which is located near the small town of Hanksville, Utah. 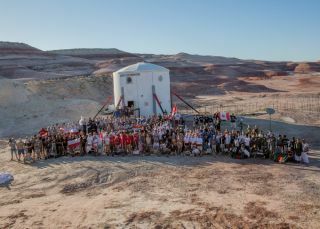 MDRS has "undergone considerable changes" in the past year, said Michael Stoltz, the Mars Society's director of development, in an e-mail to Space.com. For example, the facility has a new GreenHab (greenhouse) in place to replace a previous version that was damaged in an accidental fire in December 2014. The new greenhouse has an area for aquaponics, a type of agriculture in which waste created by fish or other aquatic creatures is used for plant nutrients. The facility also added a science lab (focusing on microbiology and geology), two electric ATVs to begin replacing the current gas-driven rover fleet, and a solar array to help generate electricity. The Hab itself has also undergone considerable renovations in the past year, including getting new furniture, new shelving, a new staircase and a new paint job on much of the interior. Next, the Mars Society plans upgrades to the MDRS telescope, which is called the Musk Observatory. The observatory is named after SpaceX founder and CEO Elon Musk, who is a long-time advocate of human Mars exploration. "Plans for the future include converting the Musk Observatory into a solar observatory and [to] build a new astronomical observatory near the station," Stoltz said. "The new [observatory] will be a robotic observatory, accessible online from anywhere on the planet. We have already made arrangements with several institutions to use the remote observatory for research and studies." An anonymous donor paid for the upgrades, said Robert Zubrin, founder of the Mars Society, in an e-mail to Space.com. The cost of the upgrades was not released. Follow us ;@Spacedotcom, Facebook and Google+. Original article on Space.com.